Roman Catholics celebrate the missionary efforts of St. Vincent Ferrer on April 5. The Dominican preacher brought thousands of Europeans into the Catholic Church during a period of political and spiritual crisis in Western Europe. Vincent Ferrer was born in Valencia, Spain, during 1357. His parents raised him to care deeply about his religious duties, without neglecting his education or concern for the poor. One of his siblings, Boniface, later joined the Carthusian order and became its superior general. Vincent, however, would become a Dominican, and preach the Gospel throughout Europe. He joined at age 18 in 1374. As a member of the Dominican Order of Preachers, Vincent committed much of the Bible to memory while also studying the Church Fathers and philosophy. By age 28, he was renowned for his preaching, and also known to have a gift of prophecy. Five years later, a representative of Pope Clement VII chose Vincent to accompany him to France, where he preached extensively. While Vincent sought to live out his order's commitment to the preaching of the Gospel, he could not escape becoming involved in the political intrigues of the day. Two rival claimants to the papacy emerged during the late 1300s, one in Rome and another in the French city of Avignon. Each claimed the allegiance of roughly half of Western Europe. Caught between the rival claimants, Vincent attempted to persuade the Avignon Pope Benedict XIII to negotiate an end to the schism. Benedict, who was regarded as Pope in both Spain and France, sought to honor Vincent by consecrating him as a bishop. But the Dominican friar had no interest in advancing within the Church, and regarded many bishops of his time as negligent leaders distracted by luxury. Vincent not only prayed, but acted, committing himself to missionary work and resolving to preach in every town between Avignon and his hometown in Spain. In a commanding style, he denounced greed, blasphemy, sexual immorality, and popular disregard for the truths of faith. His sermons often drew crowds of thousands and prompted dramatic conversions. Popular acclaim, however, did not distract him from a life of asceticism and poverty. He abstained completely from meat, slept on a straw mat, consumed only bread and water on Wednesdays and Fridays, and accepted no donations for himself beyond what he needed to survive. He traveled with five other Dominican friars at all times, and the men would spend hours hearing confessions. For two decades, Vincent and his group of friars undertook preaching missions in Spain, Italy, and France. When he traveled outside these regions, into Germany and other parts of the Mediterranean, those who did not know the languages in which he preached would testify that they had understood every word he said, in the same manner as the apostles experienced at Pentecost. Although he did not heal the temporary divisions within the Church, Vincent succeeded in strengthening large numbers of Europeans in their Catholic faith. He wrote little, although some of his works have survived, and exist in modern English translations. St. Vincent Ferrer died on April 5, 1419 at age 62, in the city of Vannes in the French region of Brittany. 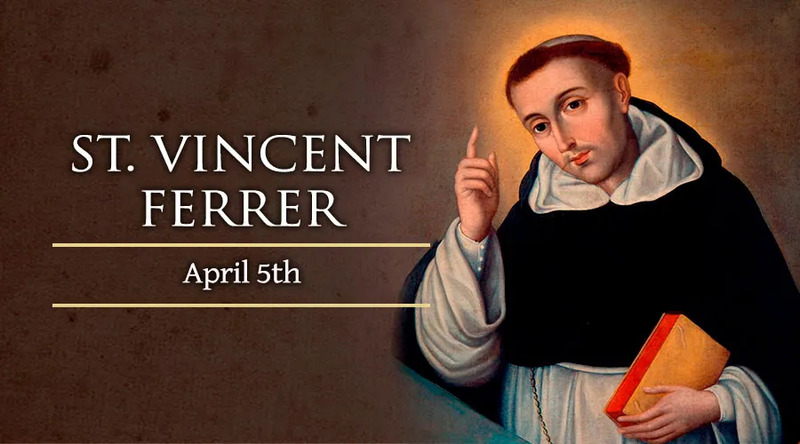 He was canonized in 1455, and has more recently become the namesake of a traditional Catholic community approved by the Holy See, the Fraternity of Saint Vincent Ferrer.